8' Deluxe Solid Wall Kit includes one 18" Cubby Kit, four 39" shelves and four 39" hanging rods. The 8' Deluxe Solid Wall Kit is part of our eastern red cedar closet system. Each wall kit includes one 18" Cubby Kit, four 39" shelves, four 39" hanging rods and all required hardware. The shelves are 12" deep.The deluxe solid kit includes solid cedar side panels for the Cubby Kit and solid shelving. 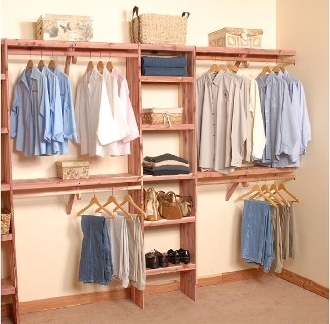 It works great as a starter kit for your own custom closet or as a stand-alone shelving unit.